Getting involved in the fight game, let alone upstarting a promotion, is no easy task. Bringing a new sport into the realm of combat sports? That seems not only unbearable, but unlikely…However, Philadelphia’s own, David Feldman has set the world on fire with his newest venture, Bare Knuckle Fighting Championship. 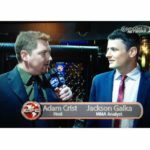 Tune in below as David Feldman goes 1 on 1 with MyMMANews’ own, Adam Crist to detail Bare Knuckle Fighting Championship debut show, future news, how professional fighters can compete on future cards and so much more!